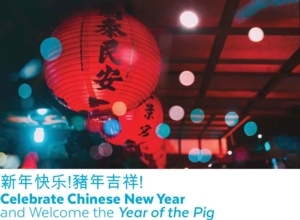 Celebrate Chinese New Year and Welcome the Year of the Pig | 新年快乐!豬年吉祥! Join us as we celebrate the Chinese New Year and usher in the Year of the Pig. Students from Holy Redeemer Elementary School will perform exquisite traditional Chinese folk dances. The students will perform the traditional Lion Dance with drummers to chase away evil spirits and also usher a year of good luck for the Year of the Pig. Jennifer Chang, Chief of Parkway Central Public Services, will regale the audience with captivating Chinese folklore tales. 欢迎来参加豬年祝活动. 天主教小学的学生会为你们 带来中国统舞蹈, 舞狮, 以及击鼓除旧迎春等等的表演. 我们的图书馆员總館長李翠娟将会给你们讲诉中国民间故事.